A Stable Ride And Plenty Of Traction: Dozer-style undercarriage allows 200 Series compact track loaders to take command in muddy or sandy terrain, as well as on slopes. The simple, rigid-track frame offers greater durability and easier maintenance compared to suspension-track systems. Superior Comfort: New Holland knows a comfortable operator is more productive. 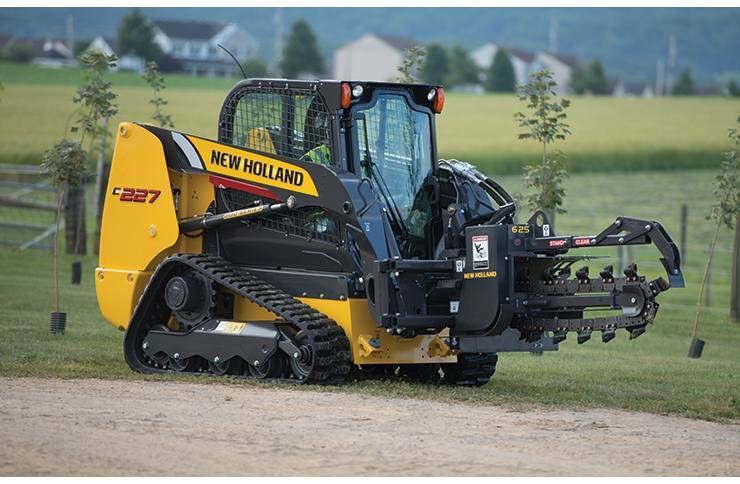 That’s why New Holland designed a cab with and convenience and incorporates it into every 200 Series skid steer and compact track loader model. No matter which model you choose, you get a cab that’s one of the widest in the industry, with more head room and shoulder room and joystick controls that come naturally to your fingertips. Unmatched Visibility: Visibility is a significant advantage when you choose a New Holland compact track loader. A low threshold to the front, a large rear window, large screen openings to the side and a see-through area on the cab roof assure you have a clear view in all directions.